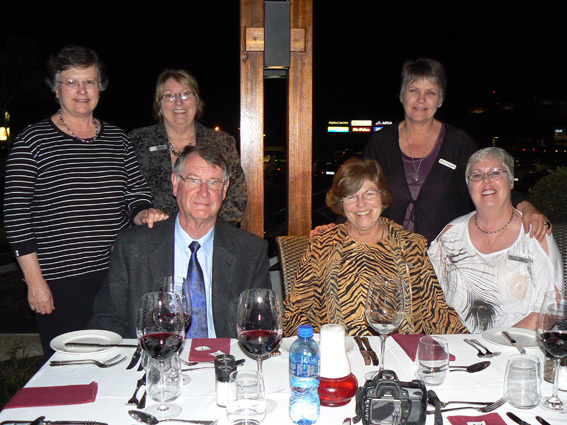 Members from Alzheimer’s South Africa who attended the CME. Front: Prof. M. Heyns (President Alzheimer’s SA), Lorna Kirsten (Regional Director, Mpumalanga) and Allyson Broodryk (Admin/Resource Office). Back: Mrs Heyns, Maureen Rochat (Chairperson) and Celia Greeff (Support Group Leader, White River). Mopani Pharmacy in conjunction with the Mpumalanga Region of Alzheimer’s South Africa and Pfizer Laboratories hosted a CME (Continuing Medical Education) on 23 August at Zest Restaurant, Nelspruit. Dr Riaan van Coller, a Pretoria based neurologist, gave a presentation on the topic ‘When forgetting becomes more than just being senile’ followed by a closing address by the president of Alzheimer’s SA, Professor Malan Heyns. Nearly 60 medical practitioners, specialists and occupational therapists from the Lowveld attended the evening and all agreed it was a very insightful presentation. The treatment of Alzheimer’s Disease was discussed as well as support strategies for the caregivers of people suffering from the disease. The message was that caregivers are not alone and are welcome to approach the Alzheimer’s association for support and encouragement. Visit Alzheimer’s South Africa for more information.